From the Pediatric Neurology Unit (C.M., E.P., D.M., F.M., T.M., E.C., S.V., D.D.V., R.G. ), Neurogenetics and Neurobiology Laboratories, Neuroscience Department, A. Meyer Pediatric Hospital, University of Florence; Neurology Unit (M.R., C.C., P.C. ), Department of Medicine, University of Perugia, Ospedale S. Maria della Misericordia; Child Neurology Service (L.P.), Hospital of Bolzano; Metabolic Unit (E.P. ), A. Meyer Pediatric Hospital, Florence; Medical Genetics Unit (M.G. ), Azienda Sanitaria Locale Bari; Neonatology Unit and Prenatal Diagnosis (P.P. ), Medical Genetic Unit, Ospedale S. Maria della Misericordia, Perugia; Department of Experimental Neurosciences (P.C. ), “Istituto di Ricovero e Cura a Carattere Scientifico,” IRCCS Santa Lucia Foundation, Rome; and IRCCS Stella Maris Foundation (R.G. ), Calambrone, Pisa, Italy. (A) Ictal videopolygraphic EEG recording of patient 3 (table 2), showing discharges of diffuse polyspike waves concomitant with myoclonic jerks evident on the leads recording from both deltoid muscles. 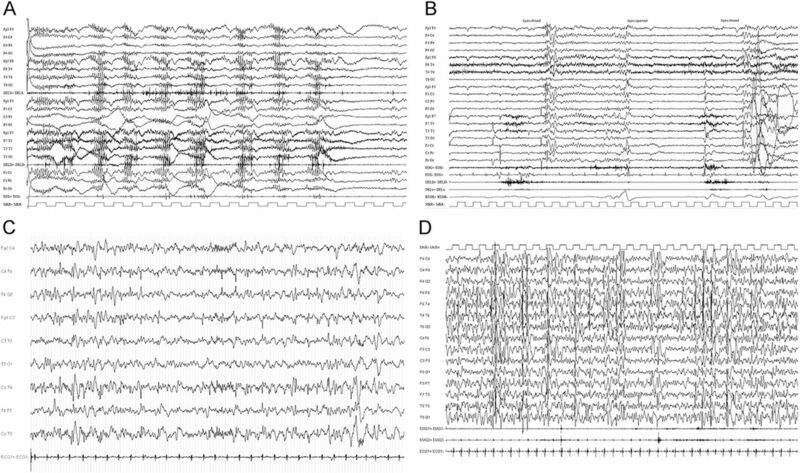 (B) Ictal videopolygraphic EEG recording of patient 3 (table 2), showing generalized paroxysmal activity evoked by eye closure with concomitant eyelid myoclonia (video available as supplementary material). (C) Interictal EEG recording of patient 5, showing bifrontal single complexes of spikes and waves with left predominance. (D) Interictal sleep EEG recording of patient 4, showing very frequent paroxysmal activity over the fronto-centro-temporal regions (continuous spikes and waves during the slow-wave sleep pattern). Structure of the human Kv2.1 channel including previously published mutations and those reported here (specified under each mutation). The protein topology was performed using the Protter online tool (29) with the Uniprot accession Q14721 (KCNB1_HUMAN). (A) Previously published patients (data from 10 of the 13 patients of previously published KCNB1 mutations and epilepsy) and (B) in our series of 6 patients. 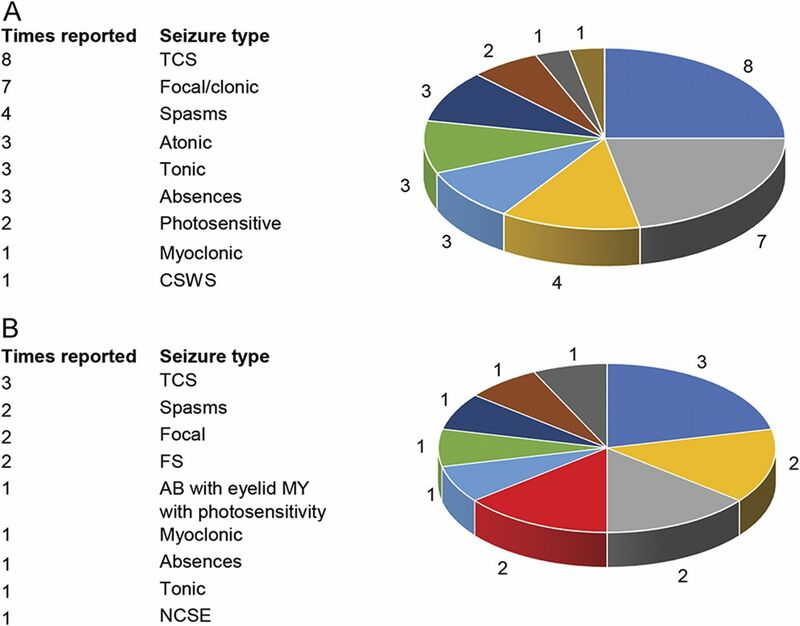 AB = absences; CSWS = continuous spikes and waves during slow-wave sleep; FS = febrile seizures; MY = myoclonia; NCSE = nonconvulsive status epilepticus; TCS = tonic-clonic seizures.